Cooking, which has always been my outlet for all the stress in my world became one more daily “to-do”. No pleasure, no fun. I been cooking, don’t get me wrong; I have to feed the husband, and myself. But, the food blogger in me was just hiding out and refused to come out and play. See, for a food blogger, its not just about cooking the meal and posting about it (I do wish that sometimes it would be that easy-peasy). A huge amount of thought process goes into “the” meal. The planning, the development of the recipe, the shopping of ingredients, documenting the process, amounts used, the teaks, the look of the final product (counting that it all went well on the first try). Then after you get it all cooked, more thinking goes into how to style it, what story to write, taking the pictures, finding the props, the right time of day, the post-processing of the photos. It’s a job guys – one that I love but, somehow the one thing that use to give me joy, made me break out in hives. I knew, I needed to take a break, at first, I gave myself the summer and without me even realizing it turned into the beginning of fall and here I am…Somewhat back. Not fully back, but almost there. Baby steps folks.. baby steps. And to start back what better way than to re-invent a favorite salad of mine. One that has more than once save me for pulling my hair out overthinking what I was going to eat that night. 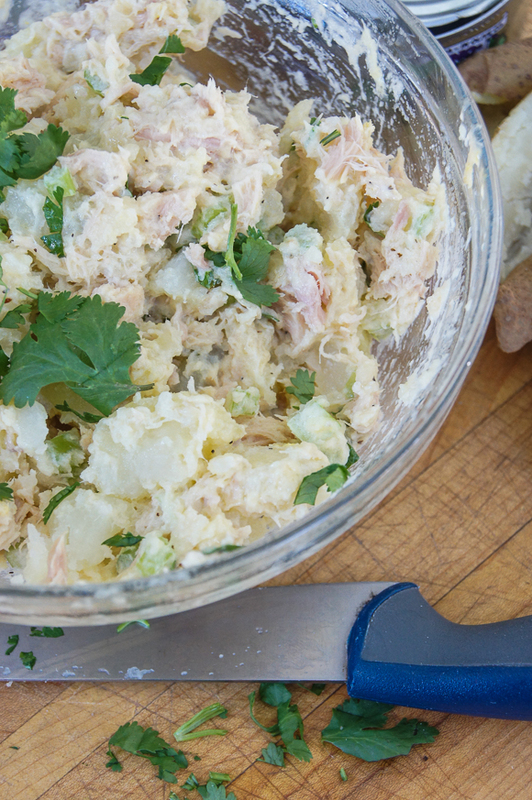 I wrote about the “original” Tuna and Potato salad before, this is the same but better, because well when you love something, you always work to improve it. Dump all the ingredients in a mixing bowl and mix. Ta da! I like my salad at room temperature, but if you are not that type of eater, then place in the refrigerator, covered to chill out until you are ready to dig in. *You can do this with any type of potatoes. You can boil them – the old fashion way…(peal, cut into cubes and add to boiling water with a bit of salt until cooked) or do as I do - simply put them in the microwave and hit the “baked potato” option and start. Done and done. Then, scoop the flesh out into a mixing bowl and get busy.